This is the birth place of Vadiraja Theertharu. About nine months later, one day when the entire family except Gauri were having food, a cow entered the paddy field in front of their house. Immediately Gauri came out of the house and started to chase the cow away. The cow ran away but Gauri sat down to relax. within few minutes she was in labor and before other members of the house could reach her, Gauri had already delivered a boy. The baby was named Bhuvaraha and Later become the great Dvaita saint Sri Vadiraja Swamy. It is approximately 25 kms away from Udupi. Sodhe/Sonda/Swathi is a small hamlet, Peaceful and non commercialized location in Northern Karnataka. Sonde /Sode is accessible by well maintained roads. There are Buses plying from Bangalore,Pune etc. 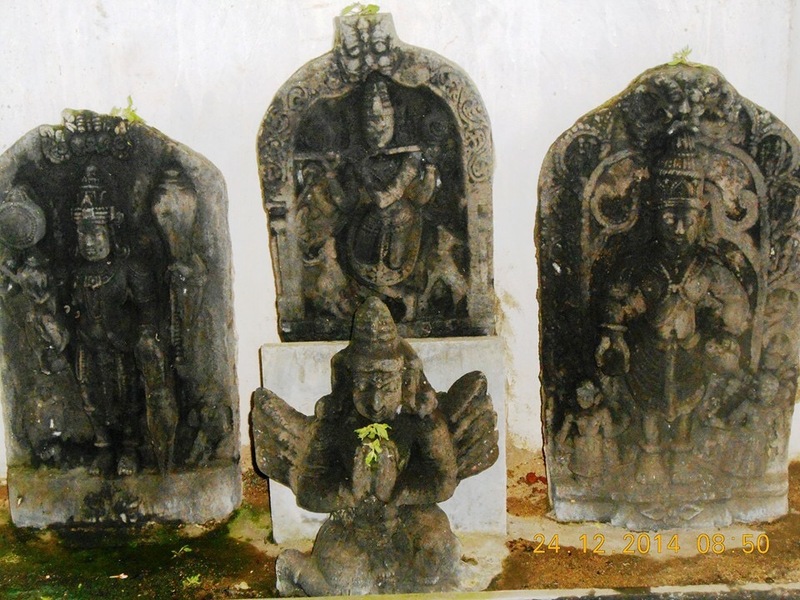 The ruler of Swadi requested Sri Vadiraja Theertharu to construct a temple as there existed no Vishnu temple at that place. Sri Vadiraja Swamy asked the king to start construction of a temple. When people questioned Swamiji on the idol, he told them that the idol of Sri Trivikrama would come to Sode from Uttara Badari (in the Himalayas). He told them that the idol is being worshipped by Sri Madhvacharya and the same was seen by him when he visited him and Sri Vyasa in Badari. It is believed that the idol was brought to Sode by Sri Bhutaraja. Bhutaraja started bringing the entire Garbha Gudi (sanctum sanctorum) of the temple from Badari. The structure is in the form of a stone chariot. On the way, he is supposed to have been stopped by a demon. Sri Bhutaraja used one of the wheels of the stone chariot to destroy the demon and made it on time to Sode. Even today, one can find that the stone chariot structure housing the idol in the temple has just three wheels. Devotees visiting Sode must definitely visit this temple and observe the unique stone chariot and the three wheels. I believe there is just one other temple (somewhere in Tamil Nadu) where the idol is placed in a chariot like structure. Sri Venugopalaswamy on the north. 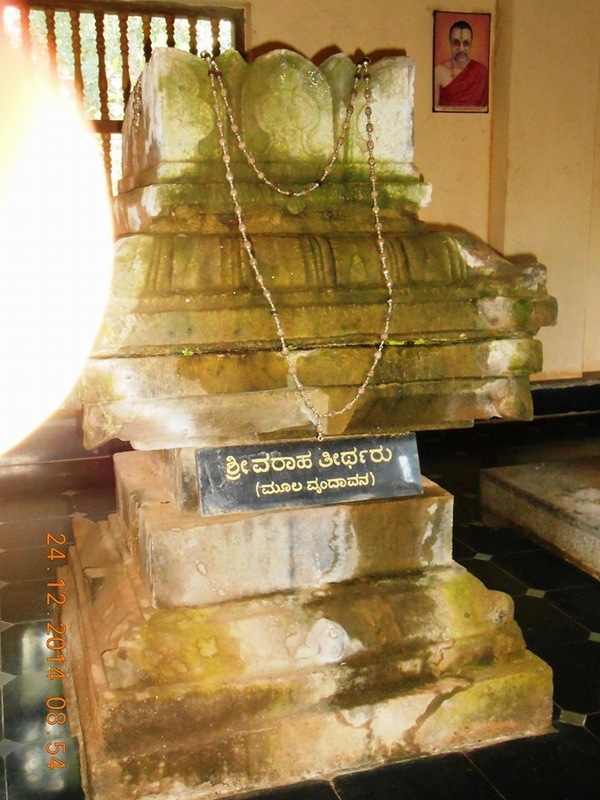 Sri Vadiraja ordered / requested the king to construct a big Brindava enough for Him to sit and install a idol of Sri Veda Vyasa just opposite to the Brindavana. He also requested for 4 small Brindavana to be surrounded by the Brindava for Him. The king constructed the Brindavanas as requested by Sri Vadiraja. South East direction of the main Brindavana has Matsya-Koorma-Varaha Sannidhi. South West direction of the main Brindavana has Narasimha-Vamana Sannidhi. North West direction of the main Brindavana has Parashurama-Sri Rama Sannidhi. North East direction of the main Brindavana has Krishna-Buddha-Kalki Sannidhi. The entire Brindavanas over and above the dashavatara sannidhis have Sri Chaturmukha Brahma, Sri Maheshvara, Sri Vishnu as well as Sri Mukhya Prana presence. This place is about 5 kms from the Matha and is on the banks of the river Shalmali. It was there that Sri Vadiraja theertharu used to meditate upon Lord Hayagriva with a plate of “Hayagriva Maddi”, a special sweet dish made by him, on his head. The Famous Seva at Sode Mutt is called as Ishtartha siddhi seva at Sonda Vadiraja Math (Which means the Seva that fulfills one’s wishes). Hari Sarvothama ! Vayu Jeevothama !